Robert Frame was a teacher of mine when I attended Santa Barbara City College. What I learned from him that helped me the most was his use of cool colors against warm colors, his constant talking about the plays of darks and light and “a true artist constructs their own canvas”. I loved his work ethic of completing paintings each Tues. and Thurs. He was a great teacher not only of oil paintings but of pen and ink and watercolor pencils. 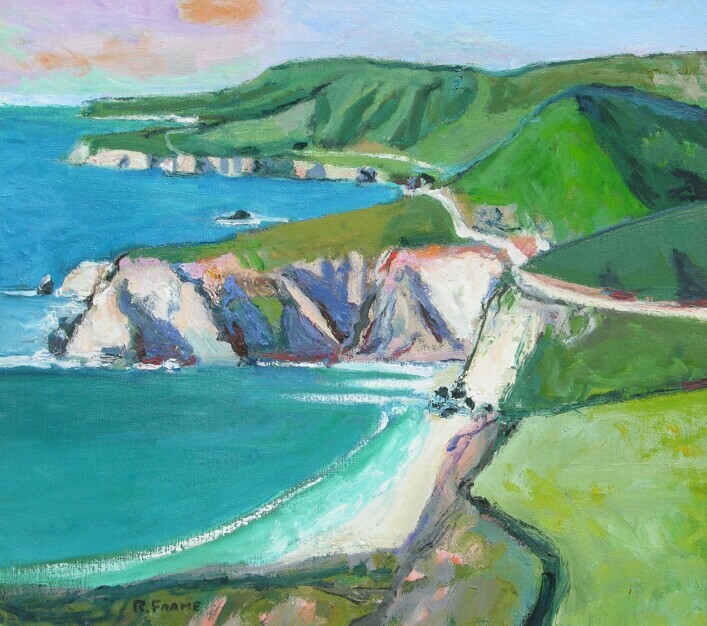 I attended one of his showings in Laguna Beach and was thrilled to see sold signs on the majority of his works. It is very inspirational to have a teacher that was a huge success and took the time to not only teach his students but listen to their thoughts. I was so lucky to have been one of his students. I have to agree with you BSK! The elevations are all wrong for Malibu, where the Coast Road runs along the coast rather than atop bluffs. However, I’ve decided to go with this title if he painted it in the 1940s when his art career began, and if he may be excused for a bit of hyperbole in dimensions. Take a look at this view and perhaps here was his vantage (not from a plane necessarily), from Escondido Beach and Point Dume, northward? Wow, Malibu?? I could have sworn this was Big Sur, until I looked at the tag. It must have been painted before it was so built up. Malibu is a treasure, and Highway One is still my preferred method of obtaining entrance into LaLa Land, and though I’ve lived on this coast for 60 years, never saw Malibu like this! Great painting, though.